Six years ago, I was a high school teacher who had just bought her first house and gotten engaged. I felt like things were finally falling into place. But that same year, I was diagnosed with bronchiolitis obliterans, a terminal lung disease. My family and I were shocked; we had no idea. I was put on oxygen 24/7 and told my only chance to live was through the process of lung transplant. Soon after, I had to step away from my career and I went from lesson planning to worrying about how many tomorrows I had left. Luckily, within a year after diagnosis, I was listed and blessed with lungs the lungs I have now. I am still shocked today at what a transformation I experienced; my incredible team of doctors and support system are reasons I can tell my story today. I have learned that no words can adequately say thank you for some things. Since my transplant, I have awakened to the beauty of a new miracle each day, celebrated so many holidays and birthdays that I wasn’t sure I’d see again, and been able to participate in 5K’s for organ donation awareness. I also have the honor of speaking to people in and around my little town about my story to encourage them to register as organ donors. But the greatest & most significant benefit has been my awakening to the beauty and value in the everyday moments. Now that I can breathe deeply, I find a deeper gratitude for those who give, a deeper love for the people around me and a deeper faith in God. Even though I carry the gift of life in me, it is the gift that carries me through this life. 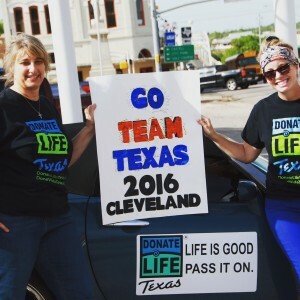 This June, I will now get the opportunity to travel to the Transplant Games in Cleveland with my closest friend with whom I also work and whose sister is a living kidney donor. This amazing honor – to meet other recipients and donors and donor families from all over – will be an incredible experience, second only to meeting my own donor family, a day I still pray to see.